Drilling mud—also called drilling fluid—is an essential component of the drilling process. Drilling mud aids in the process of drilling a borehole into the earth. Such holes are drilled for oil and gas extraction, core sampling and a variety of other purposes. The fluid is used to lubricate the drill bit and transport the drill cuttings to the surface (U.S. Environmental Protection Agency, www.epa.gov). Drill cuttings are broken bits of solid material that are produced as the drill bit breaks the rock. As it circulates up from the drill bit, the drilling mud carries drill cuttings up to the surface, where the mud and the cuttings are separated. There are three main types of drilling mud: water-based, oil-based and synthetic-based. The synthetic-based muds are more frequently used because they have less environmental impact and are quicker to biodegrade than water- and oil-based fluids. After the drilling job is finished, the mud and cuttings must be disposed of in some way. The U.S. EPA classifies drilling muds as “special waste,” meaning that they are exempt from many federal regulations. As a result, laws concerning the disposal of drilling muds vary from state to state. The state of California, for example, has a strict set of regulations and requires operators to obtain approval before they may begin any sort of disposal (California Dept. of Conservation, conservation.ca.gov). Last year in Texas, an oil company had to pay a $1.35 million fine after drilling waste that was disposed of on their “landfarm” contaminated nearby water sources (Dave Fehling, State Impact, stateimpact.npr.org, 12 Nov. 2012). Landfarms are privately-owned, state-regulated fields where drilling waste is spread, and while they are legal, they often cause damage to the surrounding environment. Throughout the drilling process, drilling mud is recirculated, which helps decrease waste by reusing as much mud as possible. When the drilling process is finished, the drilling waste must be disposed of in some way. Pit burial is a very common technique, in which the waste is placed in a manmade or natural excavation. However, burial is not a good method for waste that contains high concentrations of oil and industrial chemicals. The waste can easily contaminate soil and groundwater when the hydrocarbons and other chemicals leach into the earth, and polluted groundwater can take years or even decades to dissipate and often spreads to other areas. Most water-based muds are simply disposed of after the drilling job is completed, but many oil- and synthetic-based muds can be recycled. Drill cuttings can also be recycled and reused, after the hydrocarbons are removed. Recovered drill cuttings have numerous uses. They can stabilize surfaces that are more vulnerable to erosion, like roads and drilling pads. Cuttings can also be used as aggregate or filler in concrete, brick or block manufacturing. The U.S. Department of Energy has even researched the possibility of using drill cuttings as a substrate for restoring coastal wetlands, and some trials have been conducted in the United Kingdom using cuttings as power plant fuel (Drilling Waste Management Information System, http://web.ead.anl.gov/dwm/index.cfm). Recovering drill cuttings and drilling muds is often practical and cost-effective and is an environmentally sustainable process. The most efficient and successful way to remove volatile contaminants from muds and cuttings is thermal desorption. 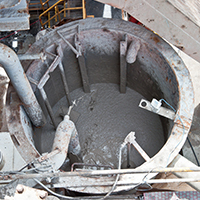 Indirect rotary kilns—like the Vulcan IDR 8440 from Worldwide Recycling Equipment Sales, LLC—are ideal for recovering drill cuttings and drilling muds. The Vulcan IDR 8440 rotary drum is housed in a combustion chamber with four 5 MMBtu burners mounted to its side, delivering a total of 20 MMBtu of heat. The drum itself is a 40’ long x 7’ diameter COR-TEN or Stainless Steel drum. COR-TEN steel—also known as weathering steel—is especially resistant to corrosion and eliminates the need for painting, as it takes on a rust-like appearance after being exposed to the weather for an extended period of time. The Vulcan IDR 8440 also comes equipped with a vapor recovery system, which recovers vaporized hydrocarbons from the primary thermal desorption unit (PTU). The system is capable of recovering drill cuttings or up to 100 MMBtu per hour of energy for reuse as fuel, reducing the total operating cost and improving total return from projects. Recycling drill cuttings and drilling muds can help operators meet disposal regulations, and the proper disposal of such waste prevents the contamination of water supplies and the soil. Through this process, muds and cuttings may be reused, saving money and contributing to the health of the environment. For more information on the Vulcan IDR 8440 or other soil remediation equipment, contact Worldwide Recycling Equipment Sales, LLC at (660) 263-7575 or wwrequip@wwrequip.com. View our complete inventory online at www.wwrequip.com.